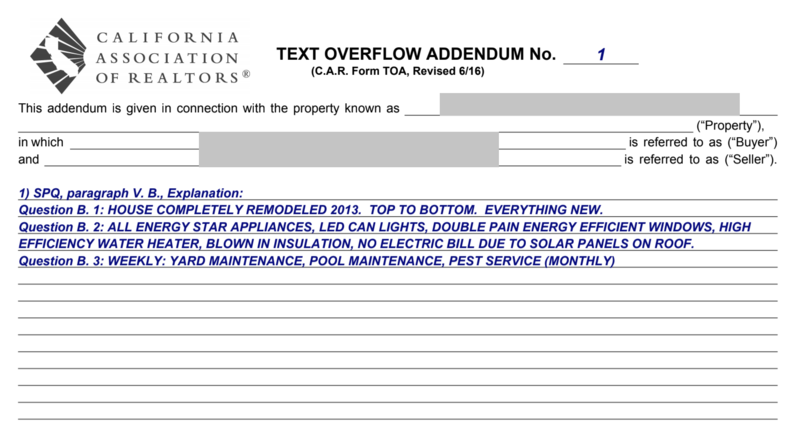 Real estate documents can be confusing and difficult to fill out correctly even for experienced agents and brokers, especially in heavily regulated states like California. Despite advances in other industries, we still ask home buyers and sellers to fill out and review many documents by hand. 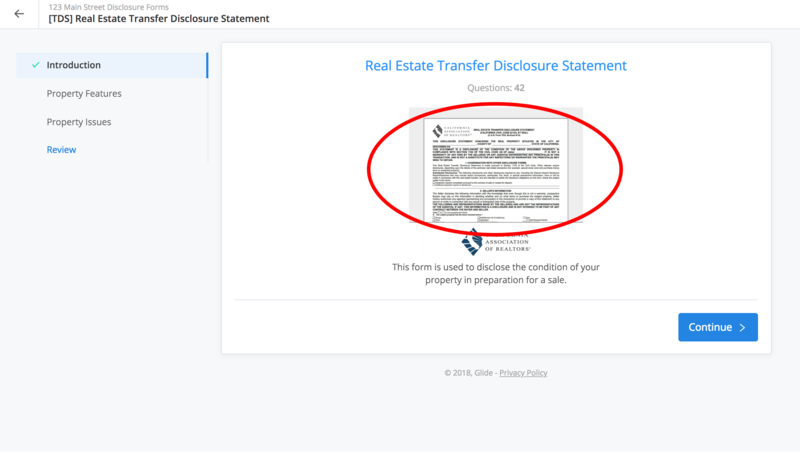 Glide has partnered with REALTOR associations representing over 200,000 agents to make it possible to prepare compliant real estate documents online in less time, with less room for costly mistakes. 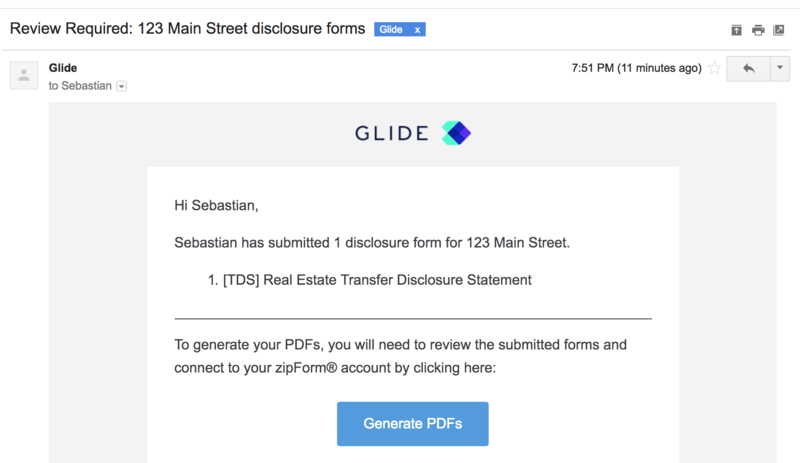 In order to allow your clients to fill out their disclosure forms using Glide, you'll first need to invite them by following the steps listed here. 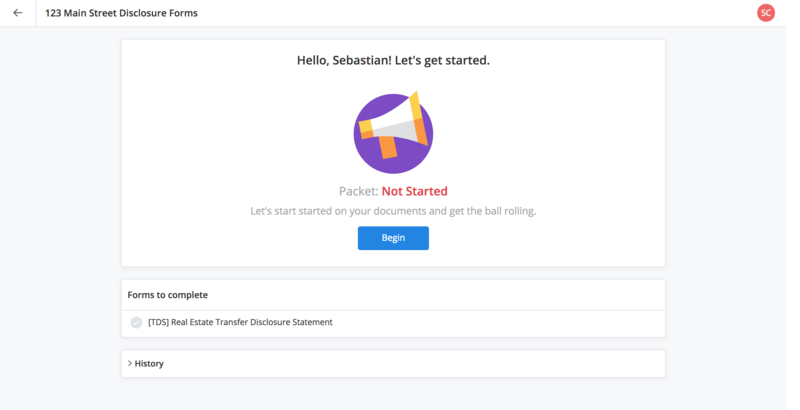 Once your client clicks the "Get Started" button in your email invitation, they will be greeted by a welcome screen that displays the current status of the form packet as well as a list of forms to complete. From here they will begin the process of completing forms. Not started - Displayed when no answers have been provided. Each form included in the form packet includes an introduction screen. By clicking on the thumbnail image, clients can view a sample copy of the document they will be completing. 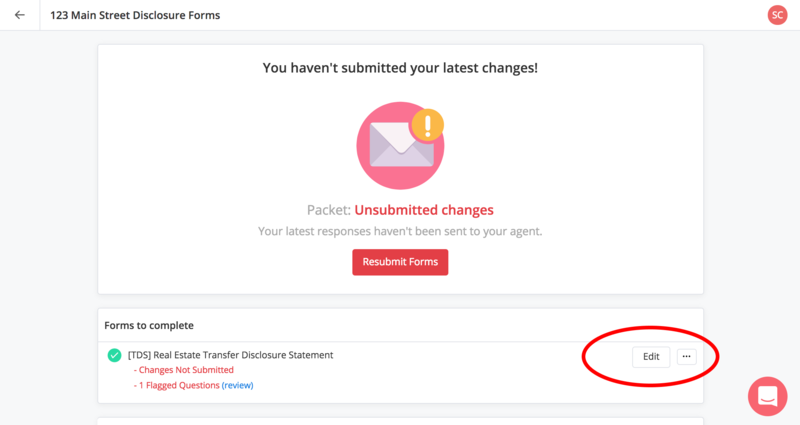 Once your client passes through the form introduction, they will proceed one question at a time until they have completed all questions for a given form. Clients can skip questions as they go, but they will need to provide an answer for all required questions before they submit the forms for your review. 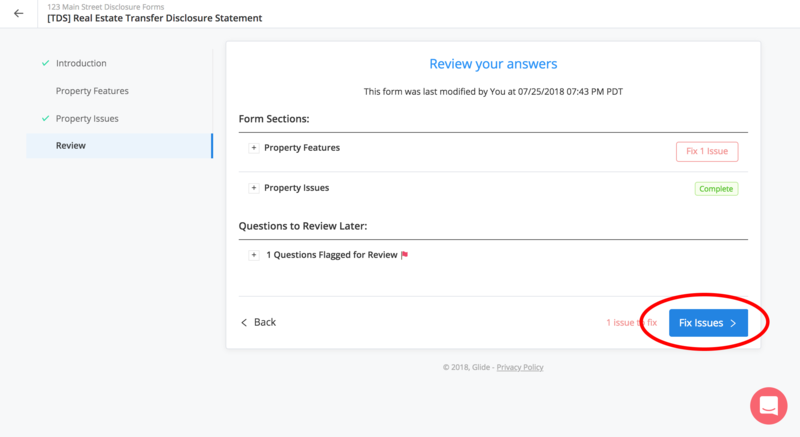 Wherever possible, Glide follows the exact wording of questions on each form. 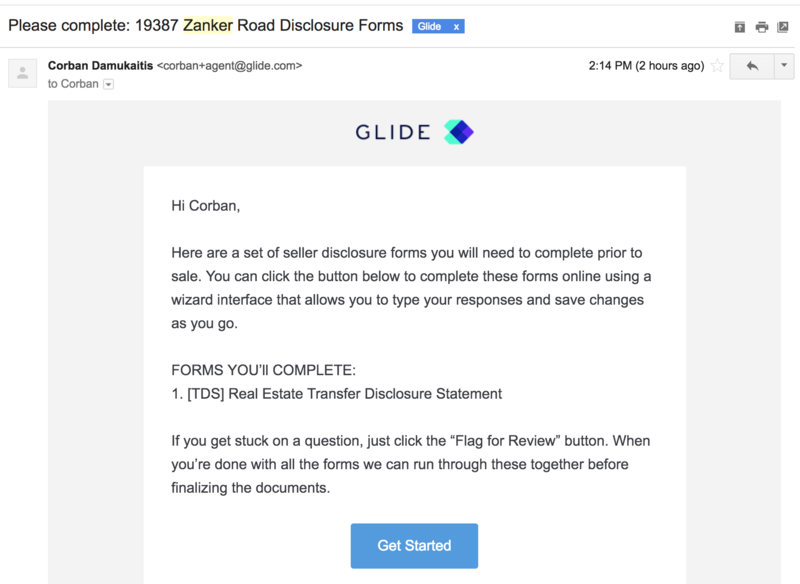 In some cases, Glide may introduce additional questions designed to simplify the form completion experience and identify potential compliance issues. (e.g. asking if a property is a condo in order to identify potential issues on the transfer disclosure statement). Glide works closely with risk managers, attorneys and professional standards committees in order to develop detailed contextual help content that helps reduce compliance risk and clarify the meaning of certain terminology. This help content is designed to educate and inform a broad audience of consumers. It is not a substitute for legal advice. Help content may include photos or links to external websites with additional information relevant to the form completion process. In many cases clients may be unsure of what they're being asked with a given question. They may also want to consult with a spouse, review documentation, visit the property, or ask for your help in order to be sure of their answer. In all of these cases, the client can use the "Flag for Review" feature in Glide to mark a question for additional attention later. Questions that have been flagged for review will be clearly identified through the review process in order to ensure they receive adequate attention before completed documents are generated. Some questions may require additional explanation beyond a multiple choice answer. This is where Glide truly shines compared to the the tedious process of handwriting or separately drafting detailed disclosure content. Where space allows, responses will be entered directly into the designated area on each form. If responses are too long to fit in a designated area, they will be automatically added to a separate page and referenced using a text overflow addendum. Most questions that include an option for a written explanation also offer clients the opportunity to attach documentation to each question. This encourages full disclosure by allowing clients to organize supporting materials such as property photos, receipts, inspection reports naturally as they fill out each form. Clients can attach documents from their local hard drive, or via cloud storage services such as Dropbox and Google Drive. Supported file types include images (e.g. JPG, PNG) and PDF. Attachments are automatically indexed and appended to each completed form as exhibits. A separate PDF file containing all attachments for each form will also be added to the relevant zipForm transaction. Once your client reaches the end of each form, they will have an opportunity to review their responses. This includes returning to any questions they have flagged for review and responding to any questions they may have missed before completing the form. All required questions must be answered before the form can be submitted for your review. Even if a clients flags a question for review, they must still provide an answer to ensure their submission is complete. The "Fix issues" button will guide clients through any questions they may have missed one at a time until all issues have been addressed. After your client has responded to all required questions, they will be prompted to submit their responses for your review. 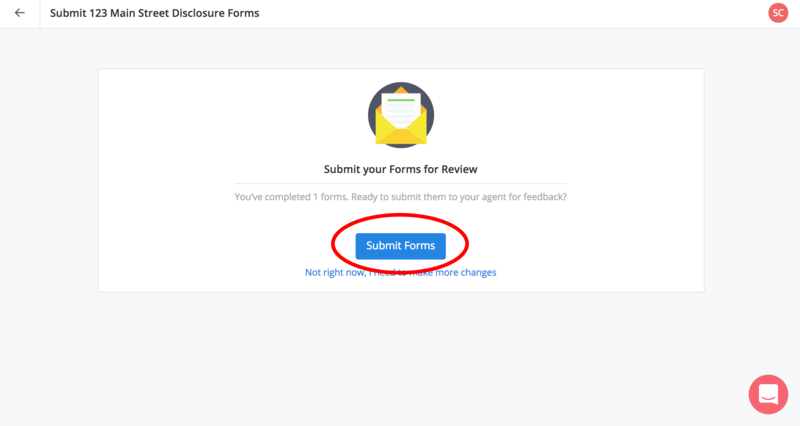 You'll be notified by email when forms have been completed, allowing you to review your clients' responses and generate final documents for signature. At this stage you will receive an email notification alerting you that your client has submitted their responses for your review.